Today is my first day joining my college's Puzzle Club. It is so much fun gathering in a group with similar interests! I meet a lot of new friends and of course asked their contact number to discuss and solve puzzles. We are asked to create a simple-yet-amusing puzzle for sharing on the next week's meeting. I usually like to create a puzzle based on a real-life situation. The idea comes from everywhere, literally, everywhere. I just came up with a puzzle based on every club member's age and birthday, so I try to collect data by asking them all by SMS. And this.. is the cause why I'm being puzzled now. I asked all of them this question: "When is your birthday?" Alice replied fast: "Lol, it's just 3 days ago fyi!" and 20 minutes later another member, Bob, said: "My birthday is actually 6 days ago." Not only that, he also wrote another message: "But believe me, I and Alice have brother-and-sister relationship... and also.... we are twin, ;) ." So here is the puzzle for you: Please explain what happened! 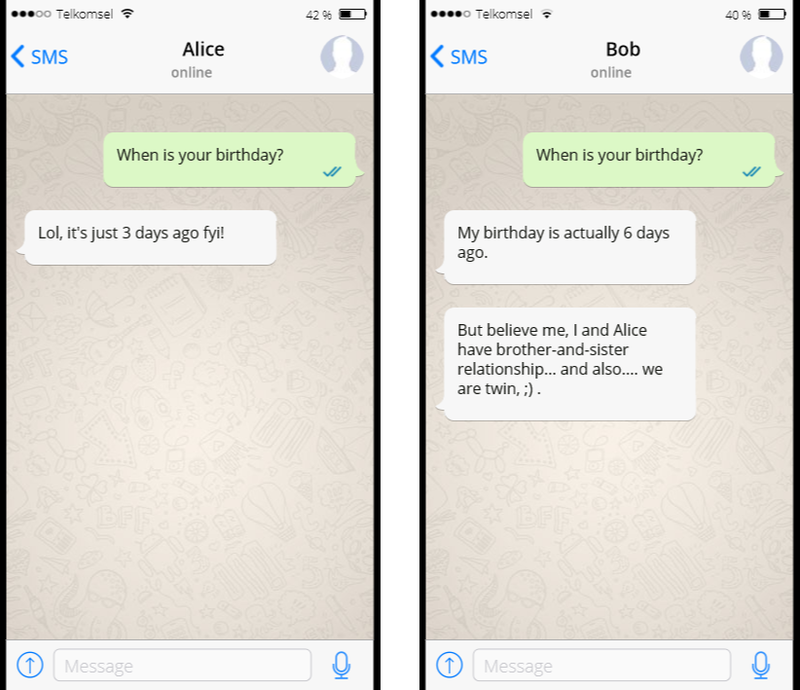 Is it possible that Alice and Bob are really twin? They were born during a non-leap year, with Bob being born just before midnight on the last day of February, and Alice being born just after midnight on the first day of March. This puts their birthdays 1 day apart during a non-leap year but two days apart during a leap year. If you asked them their birthdays during a leap year, and Alice answered you less than 20 minutes before midnight on March 4th, it would be 3 days from her birthday. If Bob then answered you 20 minutes later just after midnight on March 5th it would be 6 days from his birthday. Consider also that Bob and Alice are each a twin, but not of each other. Bob and someone were born on the 4th, having their birthday 6 days ago. They are, let's say, 20. Alice and someone were born on the 7th (in a different year) and had their birthday 3 days ago. They could be 19 or 21 or whatever is feasible for Bob and Alice to be in the same club. Now they are brother and sister, and each is a twin, and their birthdays can be an arbitrary number of days apart. Not the answer you're looking for? Browse other questions tagged logical-deduction lateral-thinking time or ask your own question. A Final Twins Puzzle: Twelve Days Difference?